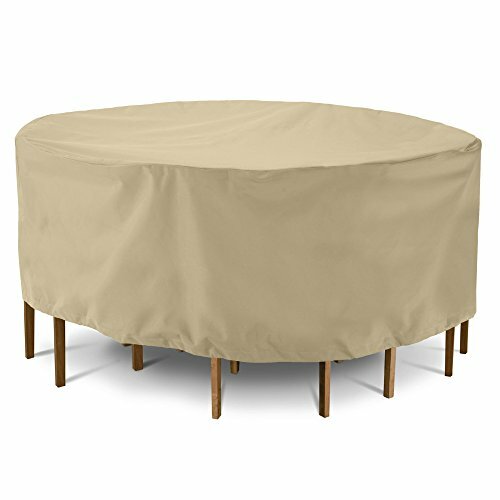 SunPatio outdoor furniture covers are designed to offer a high level of protection for your outdoor living furniture. Constructed with meticulous detail, these heavy duty and water repellent Polyester outer shell and water-resistant vinyl layer brings you elegance, durability and long-term value in outdoor investments. ► Made of tightly woven 600 denier Polyester with special water repellent processed, SunPatio outdoor furniture covers resist tearing, cold cracking and rain, much heavy duty and more durable than original version. ► Convenient velcro ties and drawstrings hold covers securely in place. ► Before covering your furniture, thoroughly clean and dry all surfaces. For tables with chairs, push the chairs completely under the table. ► Keep covers clean throughout the season by spraying, blowing or brushing off debris. Clean the cover each season with a damp cloth and mild detergent. Air dry thoroughly before use or storage. When not in use, store in a warm, dry place. Please make sure to check the size and shape of your furniture to select proper cover size before purchasing. View More In Furniture Set Covers. If you have any questions about this product by SunPatio, contact us by completing and submitting the form below. If you are looking for a specif part number, please include it with your message.